In 2006 a senior scientist remarked in the journal Nature ‘If that superconductors is made by doping concrete, I’ll know it’s time for me to retire’. We wonder if, the very next year, he was clearing his desk and getting his gold watch with the discovery of what happen when you dope today’s crystal structure. Dodecacalcium hepta-aluminate (12CaO.7Al2O3) – often just known as C12A7, is another of those useful crystal phases that crop up in cement, along with tricalcium aluminate. It even occurs in nature, as the mineral Mayenite. 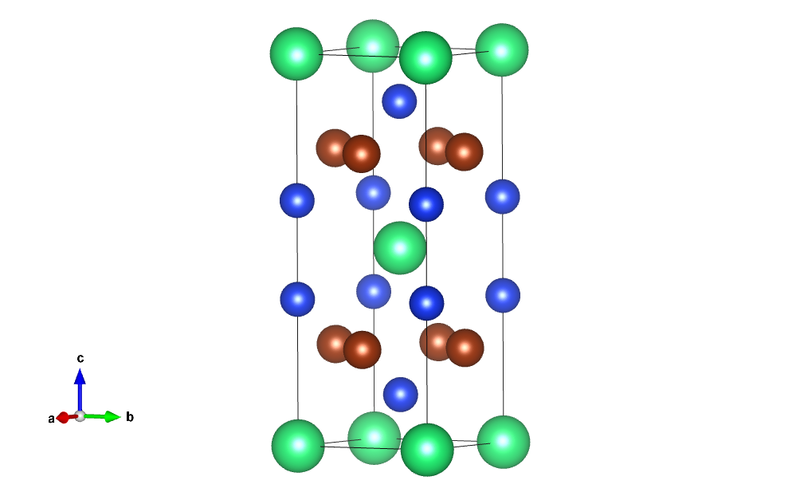 In the structure the calcium and aliuminium oxides form cages, which hold small amounts of oxygen ions. A group in Japan, discovered that if you can replace the oxygen ions with electrons you can make the material behave like a metal, which is rather odd for concrete. 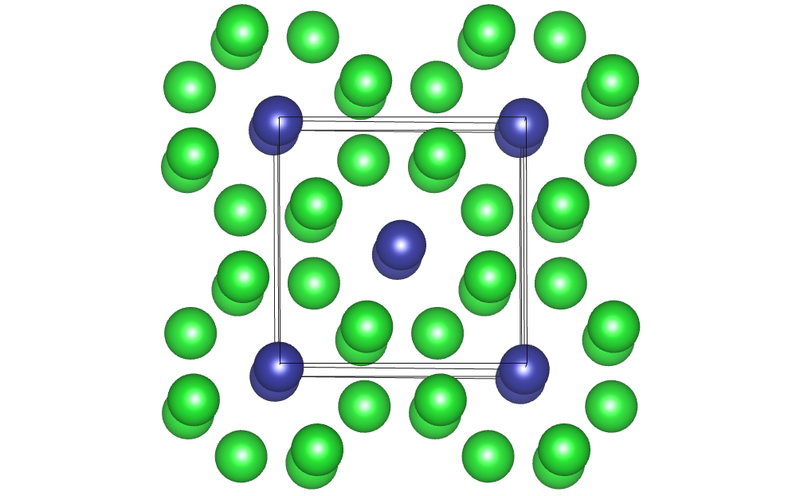 Then in 2007, the cooled the doped to 0.4 K and found that C12A7 becomes a superconductor! The key to this was how the electrons can move between the cages in the structure. The crystal structure of Mayenite was first discovered by Buessem and Eitel in 1936, and is #1011034 in the crystallography open database. SmB6: When interesting is skin deep. 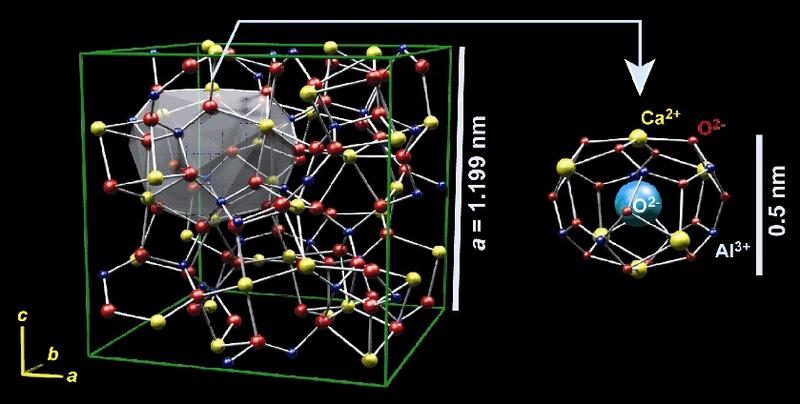 Samarium hexaboride is a cubic material. 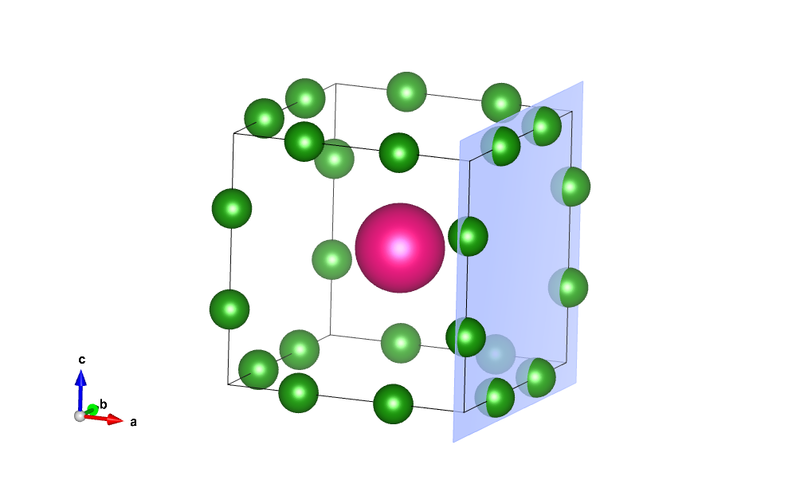 In the diagram, the samarium is the big purply atom at the centre and the borons are on the edge of the cube: we’ve highlighted one of the faces to show how the borons are arranged. This material is currently the subject of a lot of research (for example this open access paper) because it’s a topological insulator. In this context, topological means this is a really cool word that should get us a lot of grant money. I highly recommend this blog post for an explanation. There’s a saying attributed to Wolfgang Pauli: “God made the bulk; surfaces were invented by the devil.” One of the reasons topological insulators are interesting- and the easiest way of describing them- is that the bulk and surface properties are different. They are electrically insulating in the bulk but electrically conducting on the surface. Apart from being interesting in their own right- and demonstrating that, once again, condensed matter physicists will find a way to keep busy- it’s strongly suspected that topological insulators could be really useful in fields such as quantum computing. Where does the structure come from? Typical recent research: W.A. Whelan et. al., Phys. Rev. X. 4 (2014) 031012. A reference to topological insulators: Hasan and Kane Rev. Mod. Phys. 82 (2010) 3045. Even if you don’t know much about topology you know it’s got to do with holes and donuts and stuff. This paper distinguishes itself by illustrating a torus using a photograph of a genuine bona fide donut. Complete with icing sugar. I wonder how they got that through faculty? “We’d like to stump up the page charge for a colour print so that we can put a picture of a donut in our paper”. It turns out that the whole “X-Men” cartoon universe doesn’t just suffer from an obviously ludicrous premise. It also suffers from a subtly ludicrous premise: that Magneto needs sidekicks. Gd5Si2Ge2 is a magneto-caloric material. 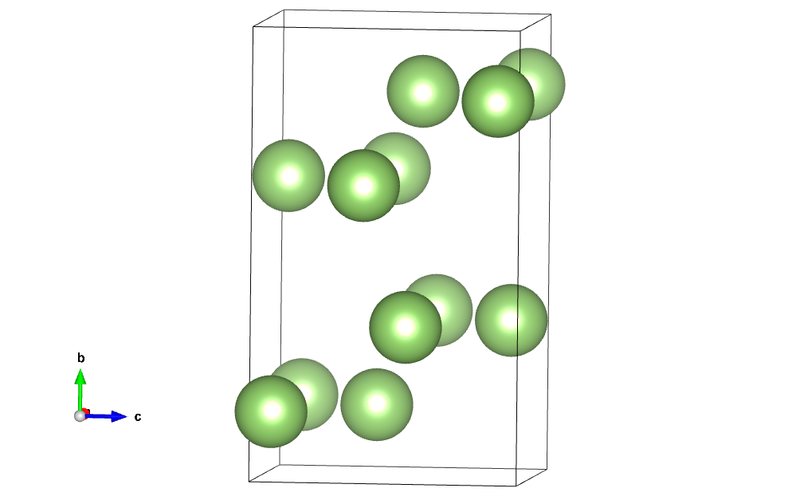 That means there’s a coupling between the magnetic properties of the material and its thermal properties. In fact, Gd5Si2Ge2 is technically referred to as a giant magneto-caloric material, which means that its magneto-caloric properties are really really big. Scientists can be very specific in their use of language. Magneto-caloric materials can be used as refrigerators. The idea works like this: if you have a magnetized lump of the material, then it takes energy to demagnetize, and this energy comes out of the thermal motion. So instead of the compression- expansion cycle of an ordinary fridge, you have a magnetization- demagnetization cycle. Magneto has always been able to bend or move any metal according to his will (even some that would appear to be non magnetic. Apparently no-one uses stainless steel or aluminium in the X-men universe). With magneto-caloric materials, he can make things hot and cold as well. With magneto-electric and magneto-optical materials, he’s pretty much got all the bases covered and he can get rid of the incompetent mutant sidekicks. The structure was published by Pecharskii, and Gschneidner in 1997(Journal of Alloys and Compounds 260 (1997) p98-p106. The same authors published the magnetocaloric properties PRL. (Physical Review Letters 78 (1997) 4494). A few years later a different group published an article showing that by adding a bit of iron, the magnetocaloric properties could be improved even more. They published in Nature. There’s a lesson in there somewhere. This is gallium, one of the few elements that doesn’t have a cubic or hexagonal structure at room temperature. Gallium is orthorhombic: the cell angles are all 90o, but the a,b and c axes are different lengths. It turns out that a and c are very close, but this doesn’t make gallium “almost tetragonal”, because it’s missing the required symmetry. Gallium has the space group C m c a, possibly the only one of the 230 space groups to have almost had a Village People song written about it. All elements are interesting in their own way, and gallium doesn’t disappoint. It has a melting point near 30oC, so it will sit on the lab bench but melt in your hand. 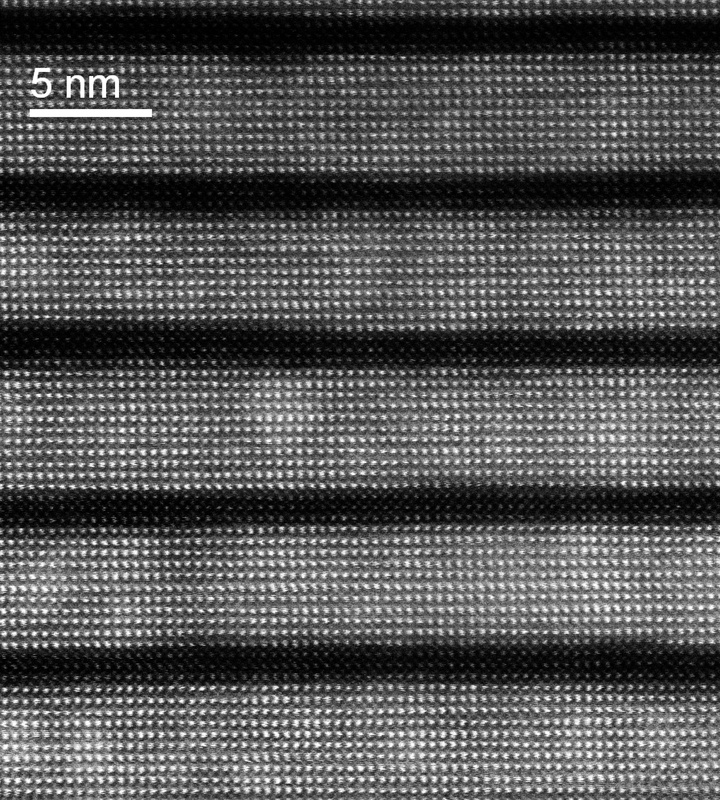 It’s heavily used in the semiconductor industry (mainly in the form of GaAs, gallium arsenide). And it has the bizarre feature of being able to penetrate metals such as steel along grain boundaries, making them brittle. Surely that’s got to be the making of a plot twist in a TV crime show. Thorium chromium silicide is the prototypical structure for a whole range of materials of the form RT2X2. The structure is tetragonal. 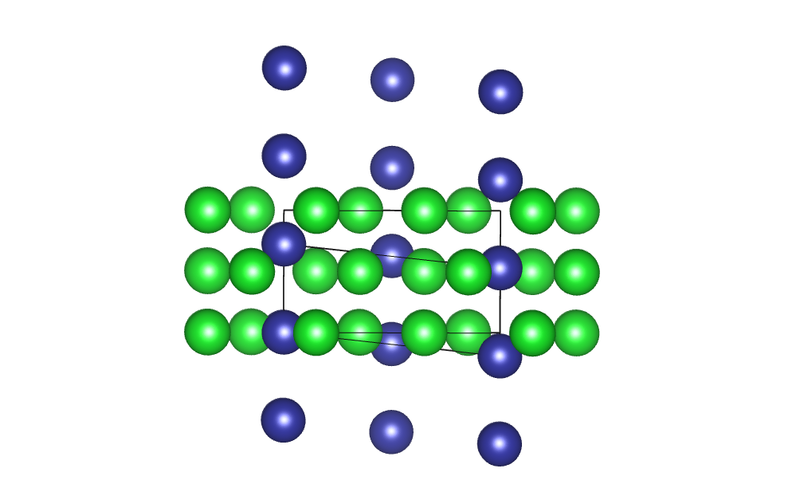 R is a Group 1, Group 2 or rare earth element, shown here in green. T is a transition metal (coloured red). X is a group 14 or 15 element (shown in blue). That gives a lot of combinations. What’s more, there’s nothing that says each component has to be a single element. For example, the X is commonly Si or Ge, but it could be any mix of the two. Ternary compounds such as this provide huge scope for exploration. For example, R and T can both have magnetic moments which interact strongly with each other, so the magnetic properties of this class of materials can be highly intricate. This is the high pressure phase Barium IV, published in 1999. It was found using a combination of single crystal and powder x-ray diffraction at 12.1GPa. In other words, about 100,000 times atmospheric pressure. 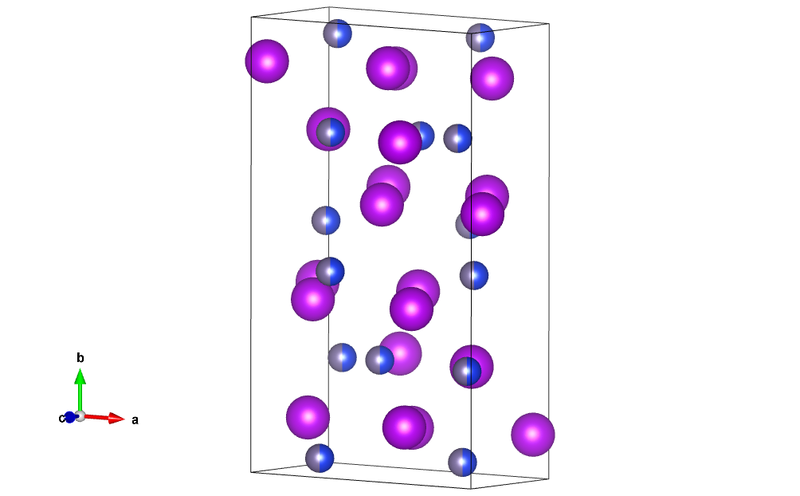 There may be some deep anthropic reason why most elements are structurally so boring at room temperature and pressure. Then again, it might just be one of those things. But it turns out that in extreme conditions (at least from a human perspective) elements can do bizarre things. 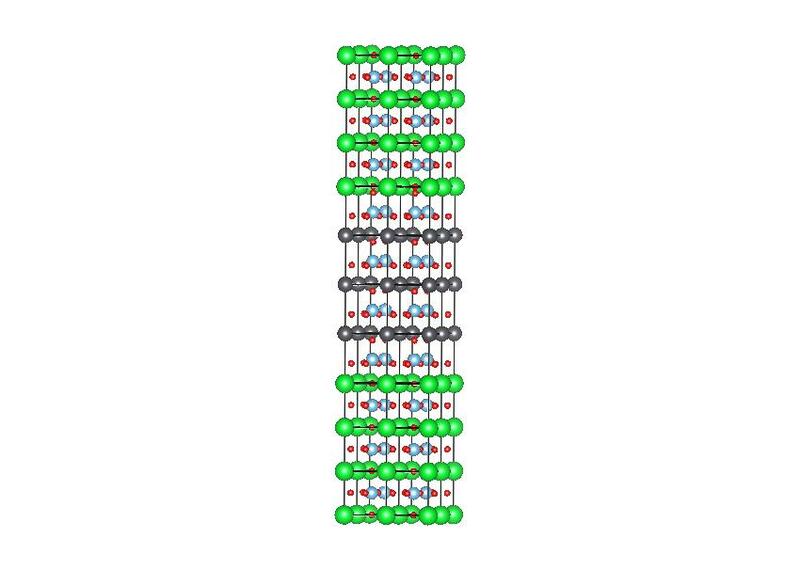 This high pressure of structure of barium shows an octagonal cage-like structure (the green atoms) with guest atoms (the dark blue atoms) sitting in the middle. The host structure is tetragonal, and the image shows the ab- plane just slightly offset so you can see the difference between the z=0 and z=1/2 atoms (the z=0 atoms look doubled up). So incommensurate means that the cell lengths of the two structures do not divide into each other evenly. So, in the c-axis, while each of the host and guest structures repeats itself, the combined structure never does. The second bizarre thing is that, while we’ve used different colours to show the host and guest structures, it’s all barium! Both atoms are the same.